BERLIN -- Volkswagen took the wraps off its seventh-generation Golf in Berlin, revealing the sharp appearance, high-quality interior, frugal new gasoline and diesel powertrains and class-leading safety features of its mainstay hatchback. 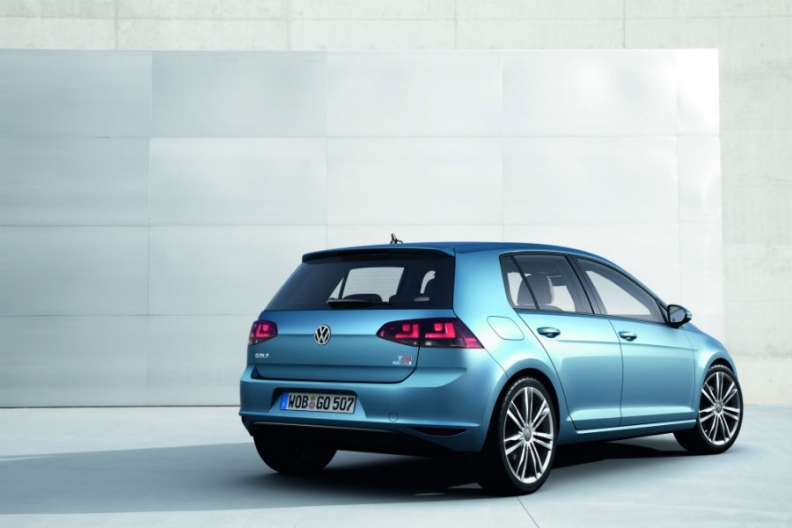 The new Golf reflects the company's reputation for technical progress, VW CEO Martin Winterkorn said. He confirmed that the new car is significantly lighter than the sixth-generation model it replaces, despite a moderate increase in size and higher levels of standard equipment. "We have been able to reverse the upward spiral in weight, but it is safer, more comfortable and more spacious," Winterkorn said. The new Golf will go on sale across Europe in November after its upcoming Paris auto show debut and is set to reach U.S. showrooms about a year from now. In Germany, the car's base price will start at 16,975 euros, which is the same price as the current base model, the three-door 1.2 TSI Trendline gasoline version. At a ceremony here Tuesday to unveil the Golf, Winterkorn said: "This is the best and the greenest Golf ever." The car's fuel consumption has been reduced by an average on average 14 percent, which means that owners will save 14 percent every time they refuel, he said. VW says the Golf BlueMotion Golf is more economical than the gasoline-electric Toyota Prius on the European test cycle, while undercutting the Smart ForTwo diesel in carbon dioxide emissions. It has CO2 emissions of 85 g/km and fuel consumption of 3.2 liters of diesel per 100 km (78 U.S. mpg; 94 UK mpg). A new 140-hp gasoline engine with cylinder deactivation uses 4.8 l/100 km (49 U.S. mpg; 59 UK mpg). First introduced to the Volkswagen lineup in 1974 as a replacement for the original Beetle, the Golf has racked up over 29 million sales worldwide over the past 38 years. That makes it the company's best-selling model and the financial foundation for the German carmaker. As tradition dictates, the new Golf receives an evolutionary look, with the classic exterior design cues of the original preserved in newly interpreted form: the simplistic front end, the pronounced front-wheel arch flares, the general shape of the greenhouse, the extra-wide C-pillar and upright rear end. Styled by Marc Lichte, who was also responsible for the design of the sixth-generation model, there is no doubt about its identity despite a new-found edginess to detailed features, including a prominent swage line running beneath the door handles. A further subtle change in appearance can be detected in the new Golf's overall proportions, with a longer hood and the cabin shifting farther back. Lichte said: "The proportions have changed. The front wheels have moved 1.7 inches (4.3 cm) forward. The front overhang is therefore shorter, and at the same time the bonnet looks l onger." VW brand design chief Klaus Bischoff said: "Visually, the passenger compartment has moved toward the rear, creating what is called a 'car-backward' impression. That's what we call the proportions of premium-class vehicles, on which the bonnet is long and the passenger compartment a long way toward the back. 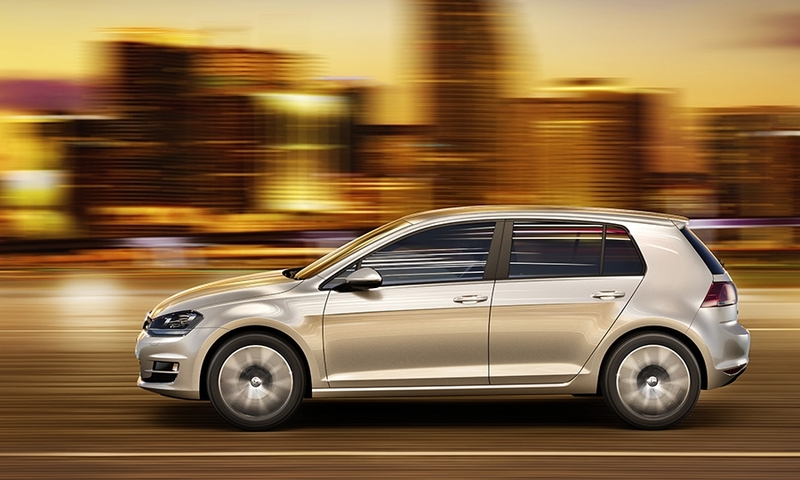 On the new Golf, we thus have proportions that you otherwise only get in higher-class segments of the market." Along with the initial five-door hatchback, Volkswagen plans a three-door hatchback, a high roof five-door hatchback (Plus), five-door wagon (Variant), four-door sedan (CC) and two-door cabriolet versions of the new Golf. 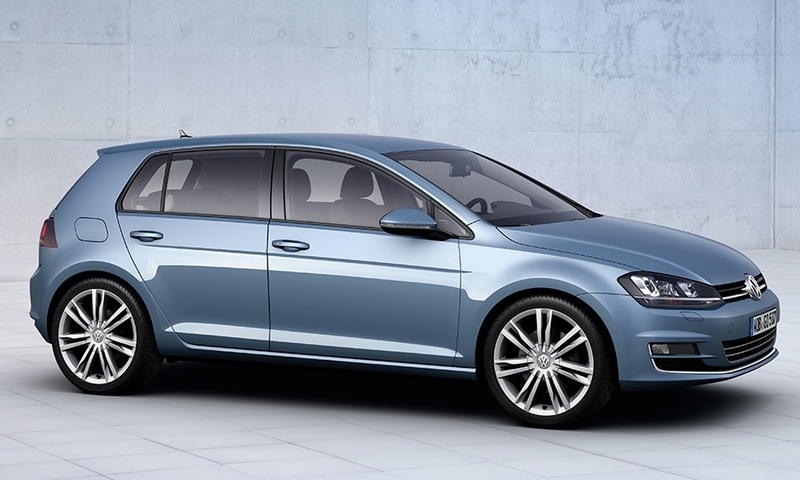 The new look will also be reflected on upcoming replacements for the Jetta, Touran, Scirocco and Caddy. Unlike the current Golf, which was a heavily face-lifted version of the fifth-generation car, the new model has been re-engineered from the ground up. "We have replaced or modified each single component. It is new in every sense of the word," said Ulrich Hackenberg, head of development at Volkswagen. Behind the evolutionary appearance of the new Golf is a new platform known as the MQB (modular transverse toolkit). Set to underpin more than half of all Volkswagen models by the middle of the decade, the highly flexible structure makes use of a higher percentage of high-strength steel than its predecessor, the PQ35 platform, leading to a 81.6-pound (37 kg) weight reduction for the platform alone. 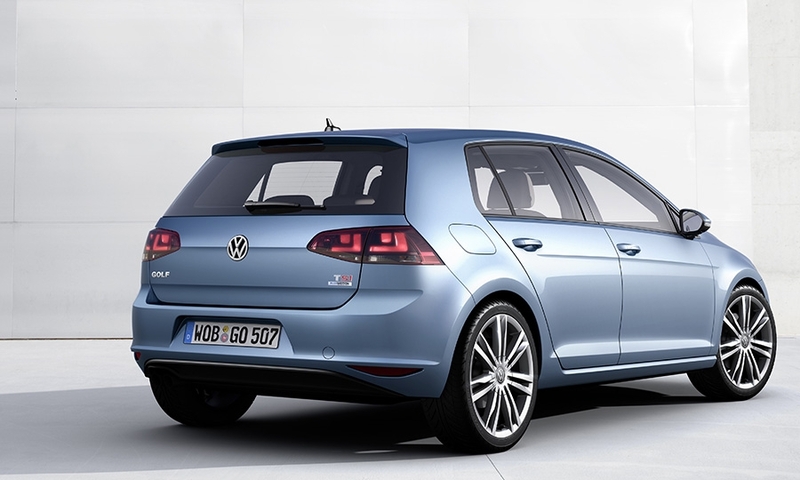 In combination with other weight-saving measures, the new Golf tips the scales at up to 240.3 pounds (108 kg) less than the sixth-generation model introduced in 2008, with a claimed curb weight of 2,314.8 pounds (1049 kg) for the most basic model, VW says. 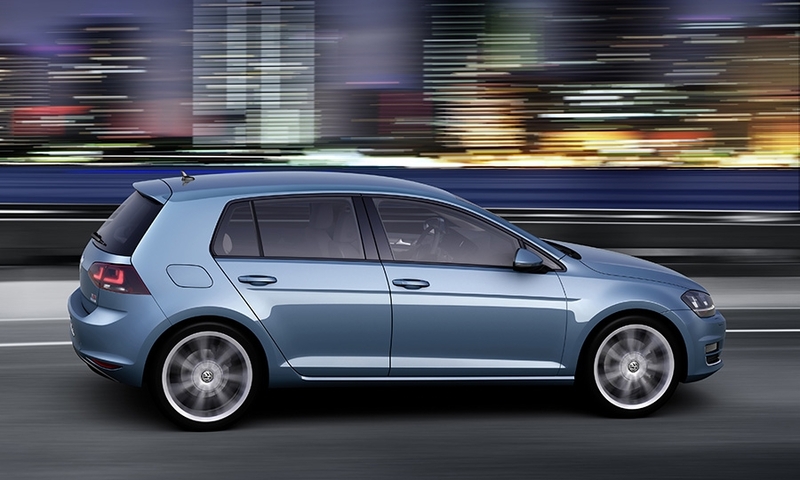 The Golf has been re-engineered from the ground up. 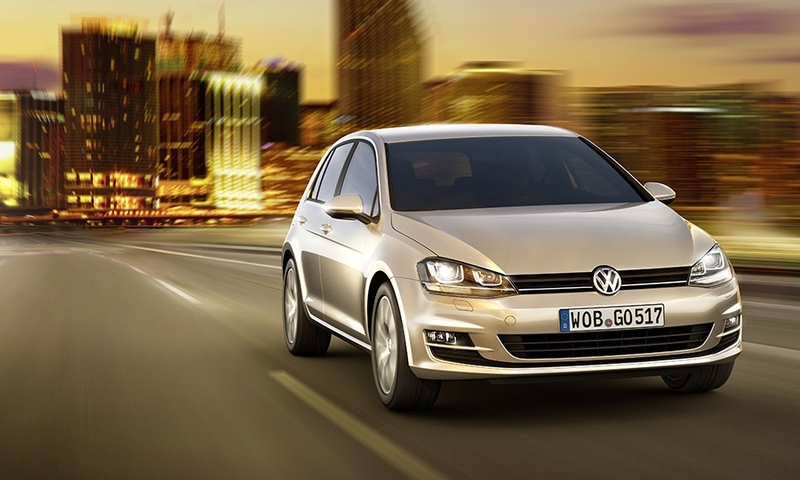 The new Golf will have a wide range of transversely mounted four-cylinder gasoline and diesel engines. All powertrains now have automatic stop/start and brake-energy-recuperation systems standard. Engineering refinements and efficiency gains see a reduction in CO2 emissions of up to 23 percent, according to Volkswagen, with standard models using front-wheel drive. Also planned for launch in 2013 is a compressed natural gas powered Eco Fuel model, running a modified version of Volkswagen's EA211 1.4-liter turbocharged four-cylinder engine. Further into the future, VW will also launch both gasoline-electric hybrid and all-electric E-motion versions of the new Golf. The new Golf continues to offer a high-quality interior with plenty of soft-touch plastic surfaces, metallic features and a damped switchgear. The car also has VW's new modular infotainment architecture. To be offered in three distinct levels, it ensures even the most basic of new Golf models will receive an integrated touch-screen monitor. 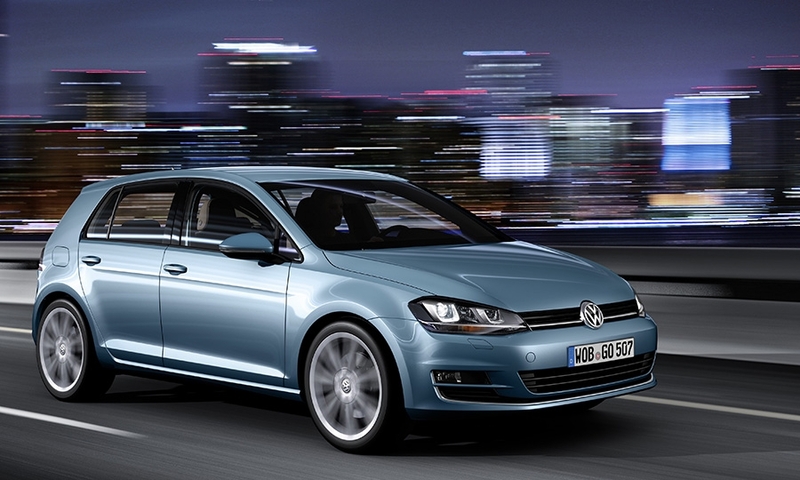 The seventh-generation Golf receives a number of new safety and assistant systems. Included as standard is a new multi-collision braking system, which automatically brakes the car to a complete stop when it is involved in a crash in order to help avoid a second impact with oncoming traffic. Also offered is proactive accident protection (Pre-Safe), adaptive cruise control that includes an emergency braking function designed to operate at city speeds to avoid low-speed impacts, lane-keeping assistant, driver-fatigue detection, traffic-sign recognition, the latest generation of automatic parking systems and automated light functions-all of which Wolfsburg officials claim make it the most sophisticated car in the hatchback class.